Ever since we moved to Barcelona people have asked us, what are some of the top places in Europe we want to go? My first answer has always been Portugal. I mean, it’s right next door and Portugal was picked as Travel + Leisure’s Destination of the year in 2016, clearly we must go! We have actually ended up visiting our neighbor France quite a bit this first year. 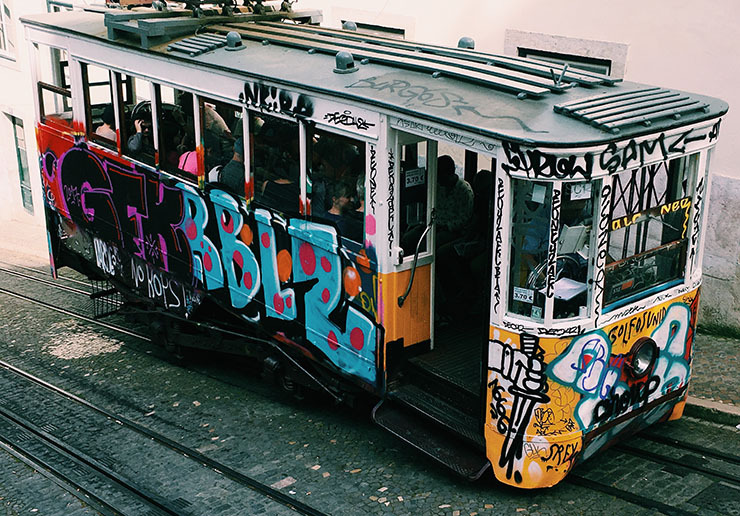 But finally for Spring Break, we created a week long itinerary for ourselves that would take us to Lisbon, Sintra and Porto. We figured why not hit them all in one trip? This will be the first of three posts. 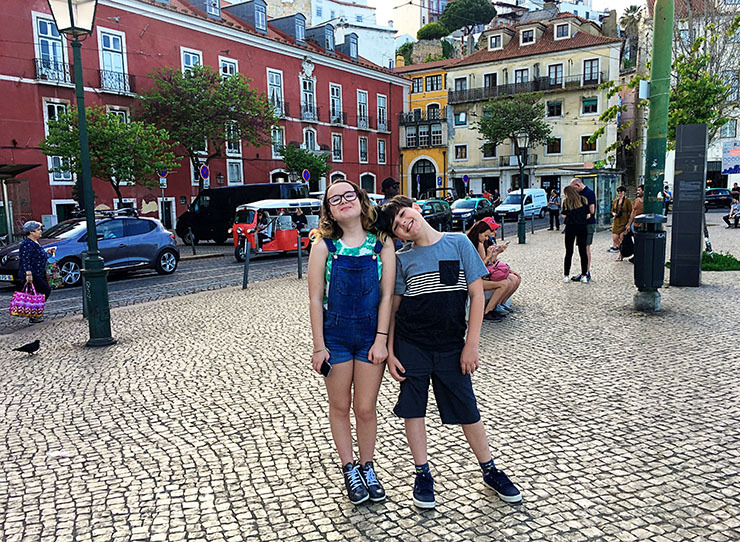 Here’s how we spent three days in Lisbon with kids! Lisbon is a smorgasboard of action. In fact, I had a slight case of sensory overload. 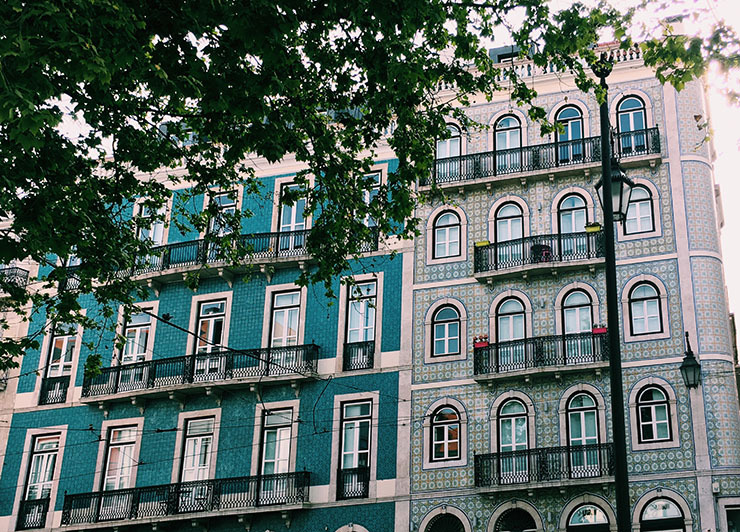 Lisbon is definitely having a moment, and it knows it. The weather is fantastic, prices are very reasonable, the city has a rich (and very traumatic) history, the people are kind (most speak English), and it has a creative vibe that just oozes into the streets. There are a lot of renovations happening. When you walk around town, you will see and hear a lot of construction. But it’s all for the sake of polishing up an already vibrant city. The real challenge is to not shine it up too much. Like any European city, we still want to see it for it’s authentic cultural self – with all its bumps and bruises. 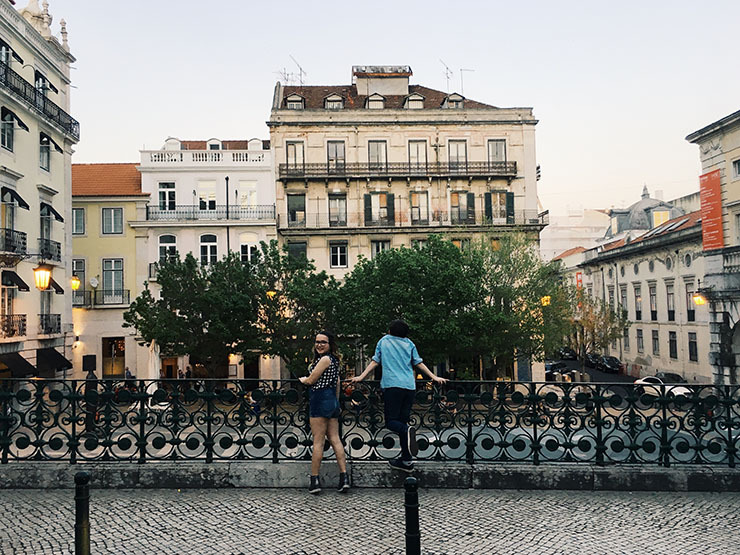 The same day we landed, we hit the ground running with a walking tour of Lisbon from With Locals. This was the first time we did a city walking tour with our kids. I figured they are old enough now and they should learn a little bit more about where they are. More than our quick and random Google searches at the airport before boarding the plane. This also took some pressure off me to know where to go and what to see. We met up with our guide Jorge at Miradouro de São Pedro de Alcântara in the Barrio Alto neighborhood. This is a fantastic promenade and park overlooking the city, and a great way to kick off our time in Lisbon. From up here he was able to explain in detail about the devastating 1755 earthquake, flood and tsunami that demolished the city. 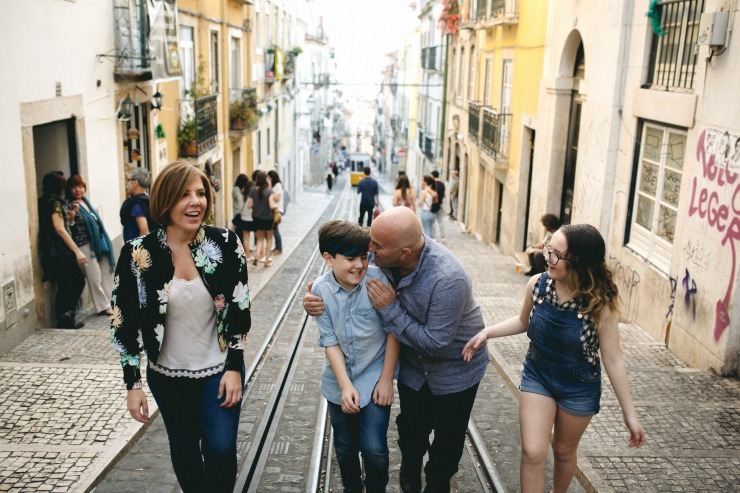 We spent the entire afternoon walking with Jorge as he explained the different areas, shared interesting and significant stories about Lisbon’s history and even engaged with the kids. When we all got hungry, he didn’t even mind stopping to let us grab a quick bite to eat. When our official time was up Jorge kept going because he really wanted us to see a few more hidden gems and end the tour at a lookout point. He took us to see some very cool street art that decorates a parking garage. Each level was done by a different artist and was a competition put on by the city. This parking garage actually brought us to the lookout point just as the sun was setting. On the way down we took a small street that lead us to Chapito. Chapito used to be just a very small circus school, but has now turned into a full performing arts school and venue for performances. Around back is a restaurant where you can dine under the big top. (We were not able to eat here – so make reservations). 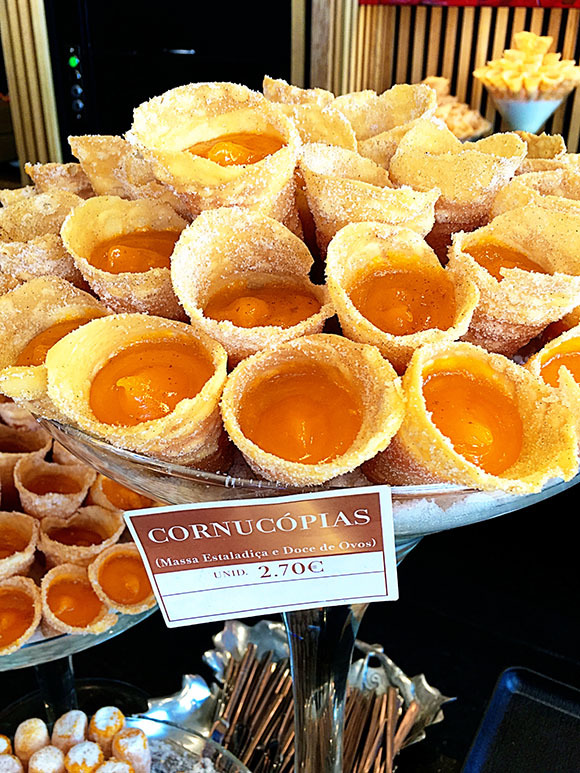 Every European city has their sweet treats, but in Lisbon they are known as “convent sweets,” as they got their name because the nuns would make them with all the left over egg yolks. The yolks remained as the nuns used egg whites to starch their whites and to clarify the convent wine. This was another interesting fact we learned on our walking tour with Jorge. The next morning Harris and I let the kids sleep in and we got up to check out the Alfama neighborhood. 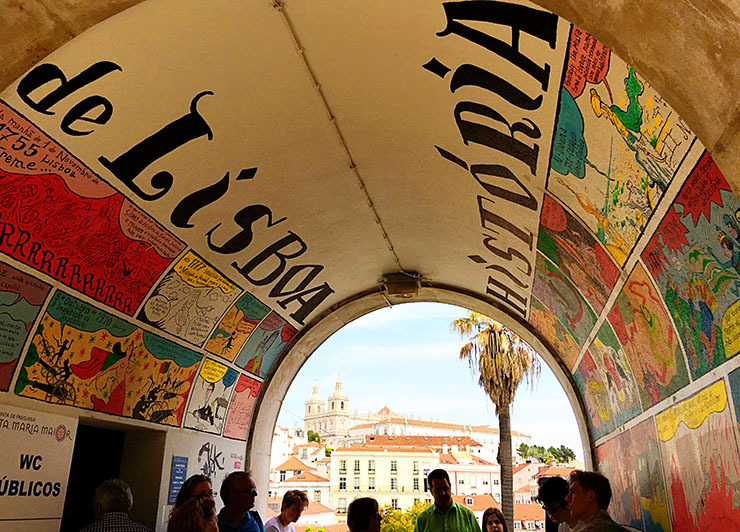 This is the oldest neighborhood that was literally built to protect the castle, São Jorge Castle. The streets are very narrow and maze-like, which was intentional to make it difficult for enemies to attack the castle. Local people still live here. We passed one woman and her husband carrying their laundry down a small alleyway. We also saw all sorts of unique and random things, such as a mannequin leg hanging from a window and a little pink cut out of a house hanging over head. While Harris made friends with a little dog I wandered happened upon a little ceramic shop. We walked what seemed to be the opposite way as we saw many people coming down, as we were making our way up, to what we had no idea. Eventually we came to a gorgeous, and very popular lookout known as Miradouro Porta das Sol. 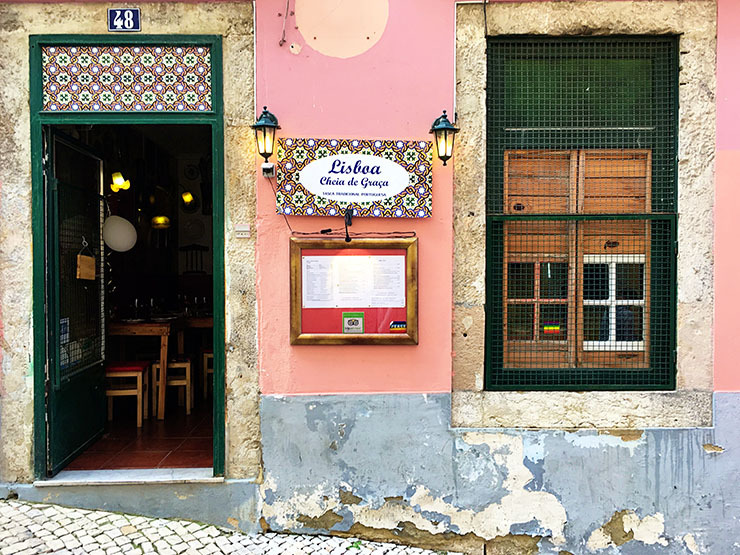 We started our walk up to the Alfama neighborhood from the waterfront, and I spotted Brunch Cafe and Reina Dona Amelia Confeitaria (Queen Amelia – in reference to Amalia Rodrigues the famous fado singer from Lisbon). These are both two great places for brunch or coffee. Next we grabbed the kids and went for lunch. 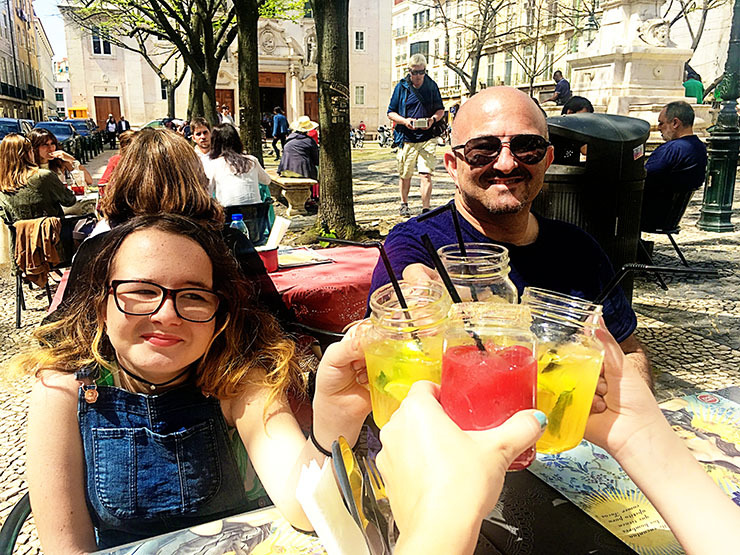 We tried to go to the popular Time Out Market, which has a variety of food stalls with some of Lisbon’s top chefs. But we were not the only ones with this idea, and it was packed. So just behind the market, we passed a nice open courtyard that had some restaurants. We actually ended up eating at Mez Cais. This is a Mexican restaurant (LOL), but we were glad to have a seat in the sun sipping on our margaritas and virgin mojitos! I obviously wanted Portuguese food, but when traveling with kids you have to choose your battles and well, tacos and guacamole won. There was also a nice Portuguese tapas restaurant in the same courtyard that was fully booked and looked pretty good, Taberna Tosca. But whatever you choose to eat, there is always room for gelato at Gelato Davvero that is conveniently right on the corner. Since the kids walked all over the city the day before and they kept seeing all the colorful tuk tuks whiz by us, we of course promised them a ride in one. This was another great way to see the city, even though this tour repeated some of the things we saw on the walking tour. It was nice to just sit and cruise through the streets, taking in the city’s charming rhythm and vibe. 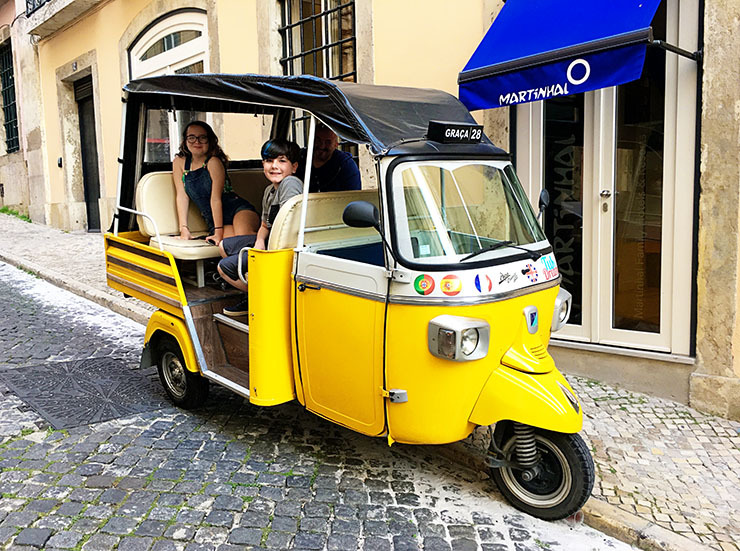 Travel Tip: Be sure to hire an electric tuk tuk – the old ones are really loud and bumpy and the ride is not as enjoyable, trust me. We enjoyed a nice authentic Portuguese dinner at the tiniest restaurant I’ve ever been in. 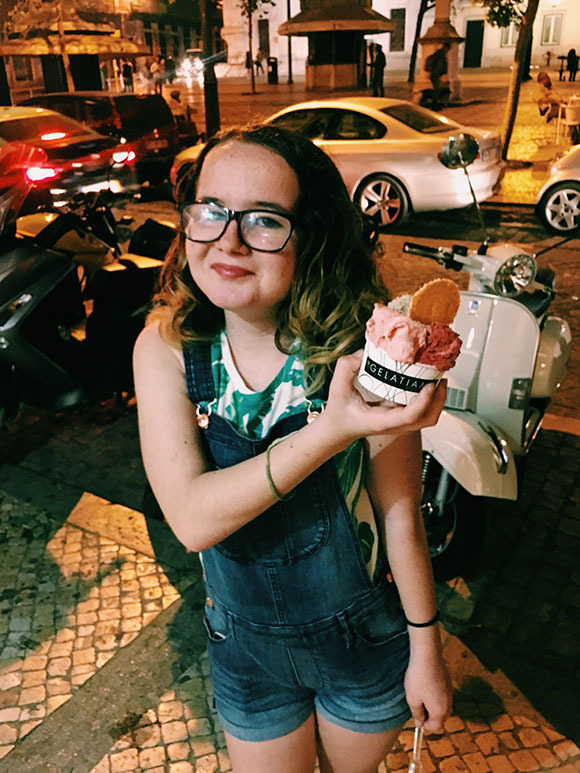 We happened upon Lisboa Chica de Graça and just took a chance. I felt like I was in someone’s house, which I’m pretty sure we were. All of the restaurants in the Barrio Alto neighborhood were similar in style, small and quaint. Both of our meals were good, but not out of this world. In fact I can’t really remember what mine was. However, the apple dessert thing we had was fantastic. We almost ordered another one, but feared we did not have enough money. This place is cash only. Another option a few blocks away that I wanted to try was Rosa Da Rua, but they were already full of reservations for the night. After dinner, we dropped the kids off back at the hotel and Harris and I went to wander some more and check out The Pharmacy. This cool little wine bar that used to be an old pharmacy, and has kept most of the original shelving and architecture. We also stopped for one more glass at By The Wine. It’s only a few doors down from our hotel, and had the most beautiful arch of colored wine bottles. It was like being in a beautifully lit glass tunnel. The next day we promised the kids they could go to Kidzania, which they had done in London and loved. Kidzania is a solid 20-minute cab ride outside the city center. We dropped them off and then went back to explore a little off the beaten path. 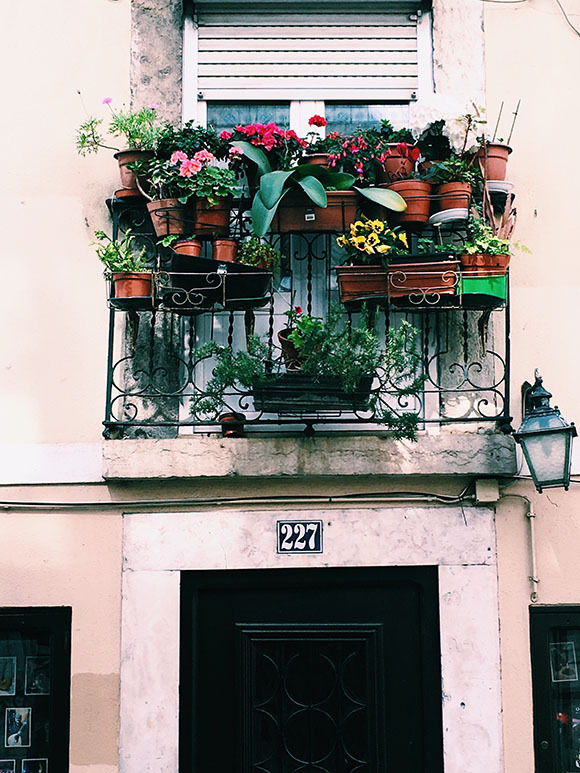 It’s in a very cute neighborhood called Estrela E Campo de Ourique. 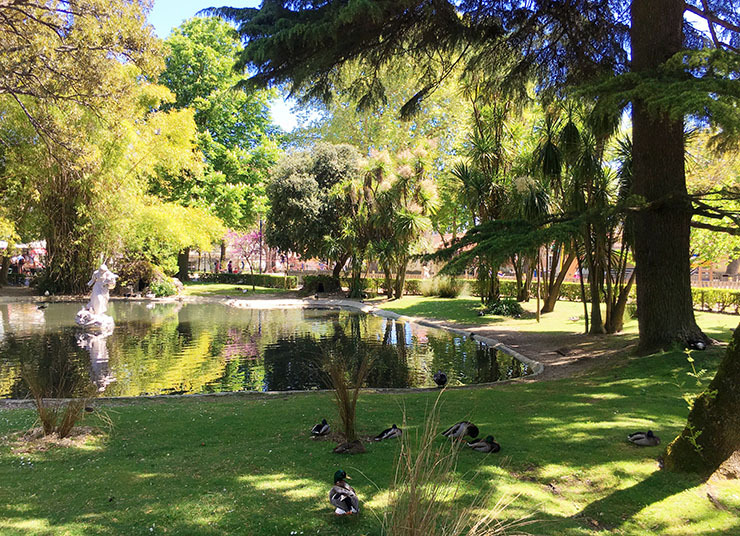 We found beautiful streets with some boutiques, and then ran right into Jardin da Estrela. This is a beautiful oasis, and a nice change of scenery from bustling city streets. This is an excellent park for kids. It has a nice playground and plenty of green space to run. There was even a man renting out some pretty cool-looking modern tricycles. Too bad we didn’t have our kids with us, but it was nice to walk and enjoy the park just the two of us. Then we had our evening family photo shoot with Flytographer! We met up with our photographer at Elevador da Bica. This is where you can get one of the iconic trolley car shots in Lisbon since it goes up a hill and you can get the river in the background. 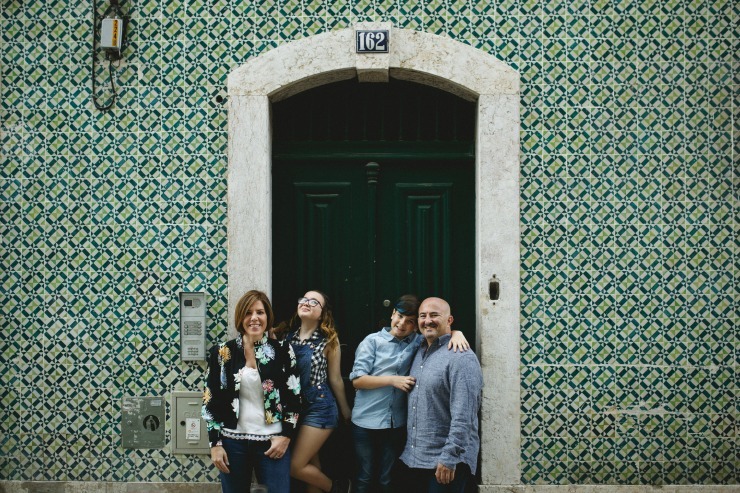 Our photo shoot gave us another opportunity to wander the streets and take some fun family photos. This was something I have been wanting to do forever and thought Lisbon would back such a fun backdrop! 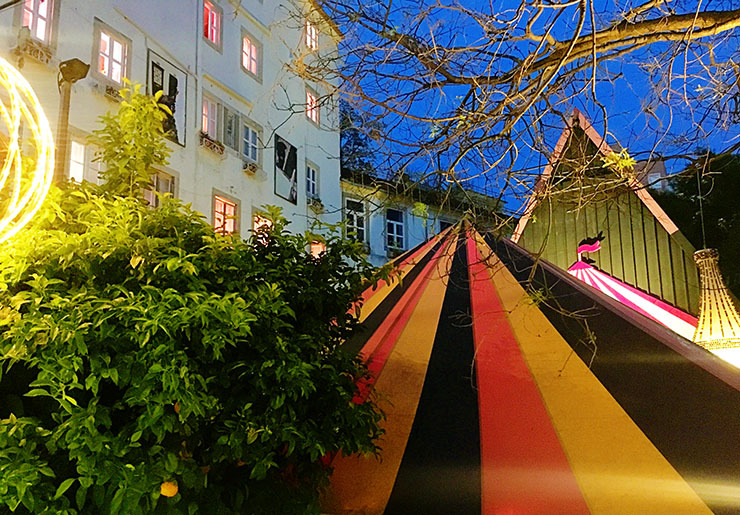 We enjoyed a stay at the Martinhal Chiado Family Suites. 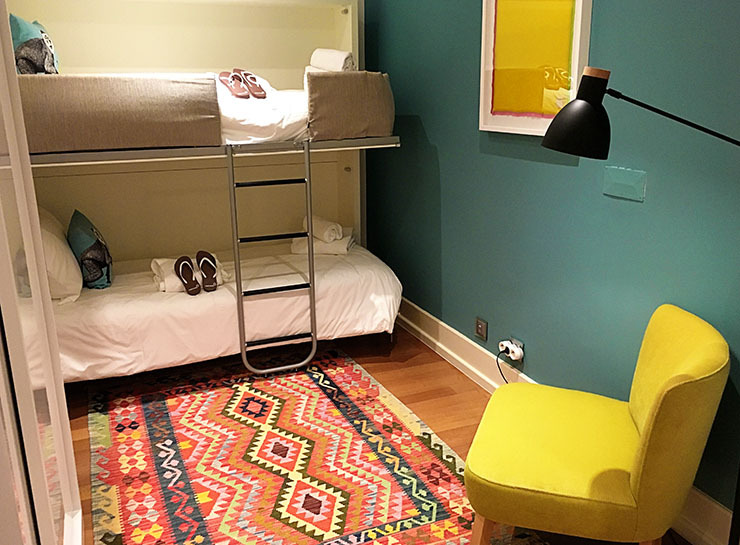 This is a brand new hotel in the center of Lisbon that is excellent for traveling families with young kids. They have modern, apartment-style suites that come with full kitchens, washer and dryer, high chairs, booster seats, cribs and even bathroom necessities like toddler potties and step stools. We had a one bedroom deluxe, that had a enormous living room and a bunkbed room for the kids. Breakfast was included in our stay, and there were a variety of food options to choose from. I loved their kid-friendly dining room. 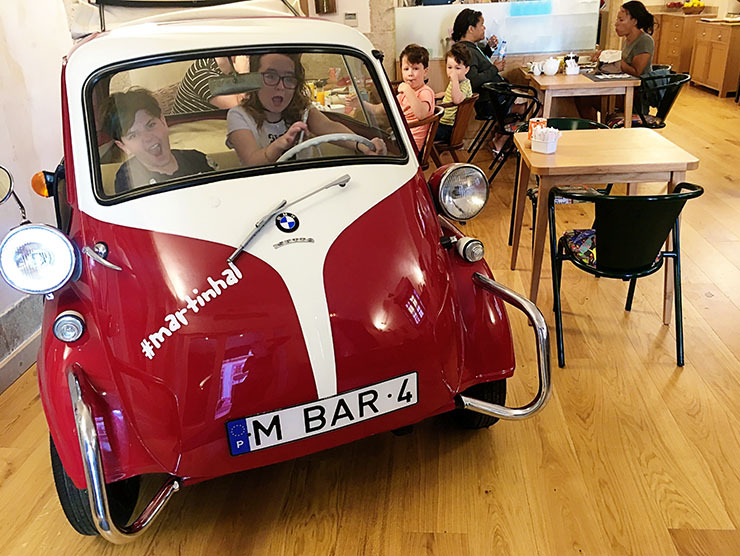 It’s got large tables, booths, pillows and even a car for the little ones to play in while they waited for their food. The best part about Marthinal Chiado Family Suites is their childcare facility right on the property. It let’s you go out an enjoy the city for a kid-free day or allows you to have a dinner out with your spouse. The kids center has activities for kids up to about age nine, but they will of course watch older kids as well. The hotel has movie nights, the kids can play Xbox, or you could drop them off with their own electronic devices. Our kids were a bit old for the kids center. We are very comfortable leaving our kids in a hotel room together on their own for two or three hours. My daughter has a phone and can message us using WhatsApp. We have a very mature 12 year old. 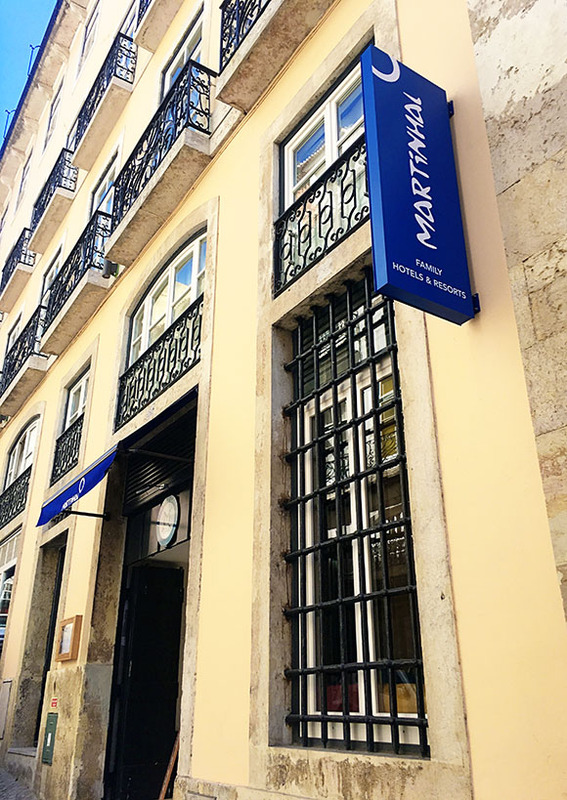 The location of Marthinal is in the Chiado neighborhood and is very centrally located, it was very easy to walk and access so much of the city. The entire staff at Marthinal was very helpful throughout our entire stay and I highly recommend this property for those traveling with young children. We had a great three days in Lisbon. I think three days is a perfect amount of time to see the city with kids. It felt like a mix of San Francisco and Cuba, probably because of the hills, trolley cars, and construction. My husband and I agreed that this is probably what Cuba would have looked like if it hadn’t got stuck in the 50’s. Lisbon is a funky little city, and I was happy to see that even though it’s growing, it’s preserving its history, tradition and charm. Thank God the only Starbucks we saw was at the airport. I was also really glad we did a walking tour on the first day. 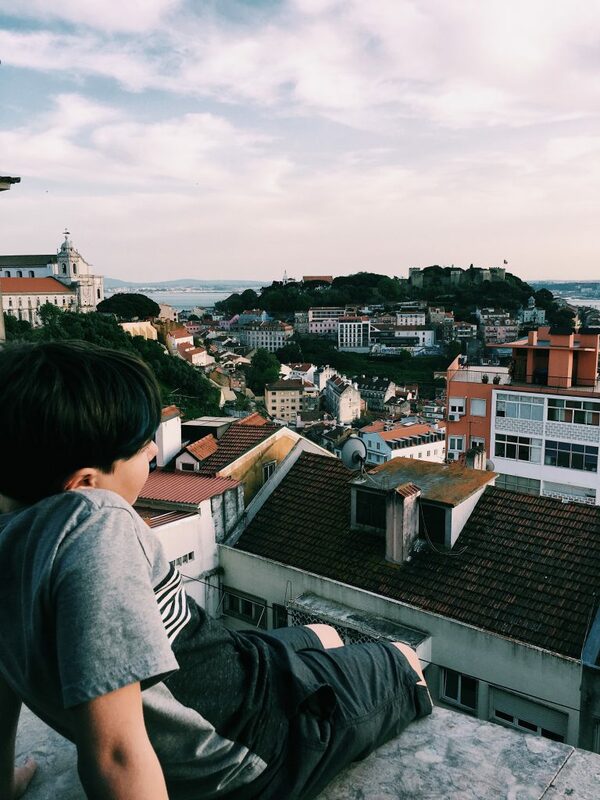 I felt that I had a better understanding of Lisbon before we set off to explore on our own. We did not get to some of the kid-friendly museums that were recommended to us because we opted to send the kids to Kidzania for the day instead. I am not a huge museum traveler anyways. I prefer being outside and parks so that was okay with me. We did not plan our dinners as I think we should have. We sort of just left that to chance. This was a mistake since it was Easter week and many restaurants were booked. One restaurant that our tour guide Jorge tried to get us into was Maria Catita. He’s a local so I’d trust his recommendation. Another thing I’d recommend for your visit is to please wear quality, comfortable shoes. The streets and sidewalks are hilly and made of small stones, which are actually pretty smooth and can even be a bit slippery. With the cable car tracks, uneven sidewalks, and construction, you need to watch your step and have flat shoes on! 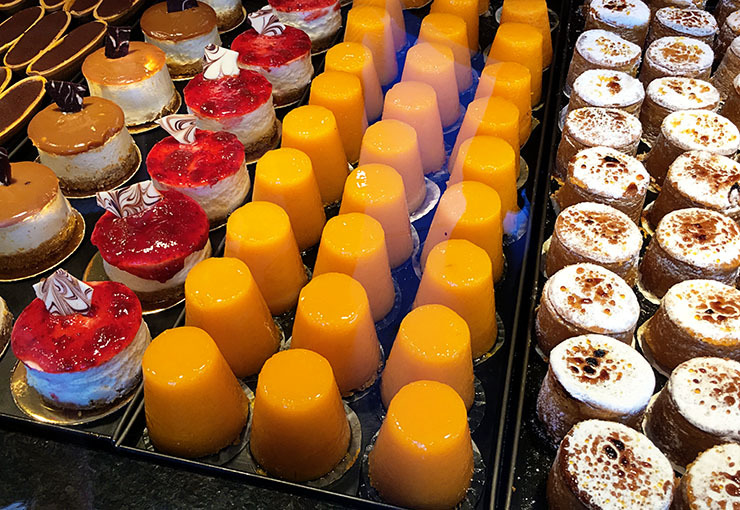 Travel Tip: We had fantastic gelato at Gelatiamo – twice! 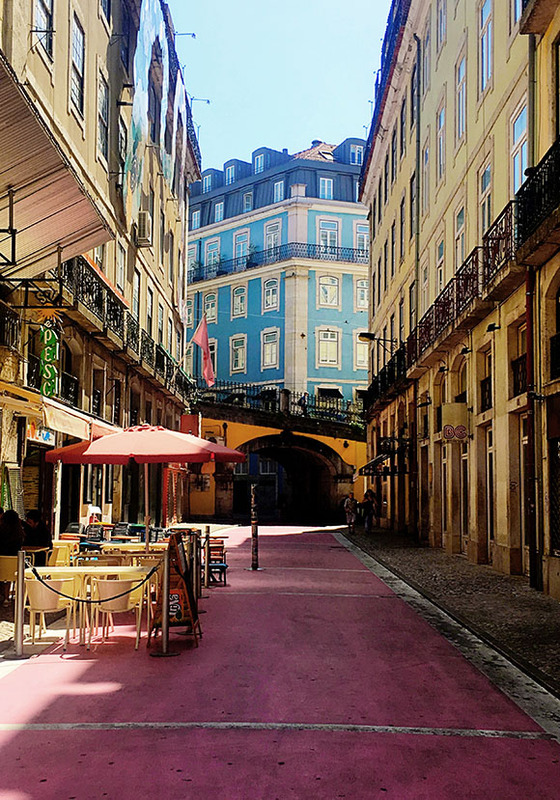 Travel Tip: Yes, Pink Street is pink. But don’t expect it to be as bright and shiny as all of those over-photoshopped photos on Pinterest. There are a few bars but sadly it’s not as exciting as one might hope. Disclosure: The Marthinal Family Suites was a fully comped media stay for the purpose of my review. Read my honest opinions over on Walking On Travels. I share this with you because I think it is a fantastic property for anyone traveling with young children. Gooցle account. I look forward to brand new updates and will share this site with my Facebooк group. Hi Andrea! 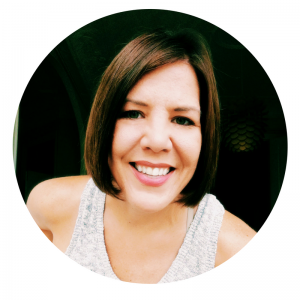 So glad I changed upon your blog. We’re planning a trip to Portugal in November with an 18mth old and a 5 year old and doing Lisbon-Sintra-Porto. We’re thinking of renting a car for the trip up to Porto and stop for two nights in Sinatra. I saw you mentioned that car may not have been such a good idea. Would love to know why. And yes a post about Porto would be lovely!! Thanks so much! !